Marian Kemp, Euncie Bynder and Alice Muir were appointed as grandmother liaisons four months ago for the Armadale Health Service. Their role is to each spend one day a week supporting indigenous mothers during and after their pregnancies. 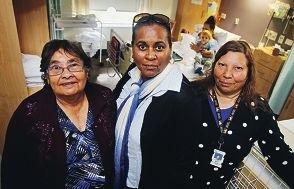 Aboriginal Health Officer Christine Parry, who co-ordinates the team, said the women imparted their mothercraft skills and conducted home visits with midwives. They also offer transport to and from appointments to encourage the mothers to attend antenatal checks. ‘I have six grandkids of my own and felt it was a good opportunity to pass my experience on to the younger ones, to offer my services to my people,’ Mrs Kemp said. The women help organise food vouchers and baby clothes and are there to answer questions mothers might be too embarrassed to ask their midwife. Mrs Bynder, who has 40 grandchildren, said she did not view the role as a job. ‘I like to see them improve in their future and I look at it as a way of helping these underprivileged kids,’ she said. ‘The mothers need to know to come in for all their checks to ensure they have a healthy baby. ‘I like going out with the midwife and seeing the baby has put on weight well and think the mum is doing a great job. For more information on the program, call 9391 2000.